Suffolk County Gutters is a professional gutter system service provider company that specializes in installations, repairs, and gutter system maintenance for residential and commercial structures and homes. 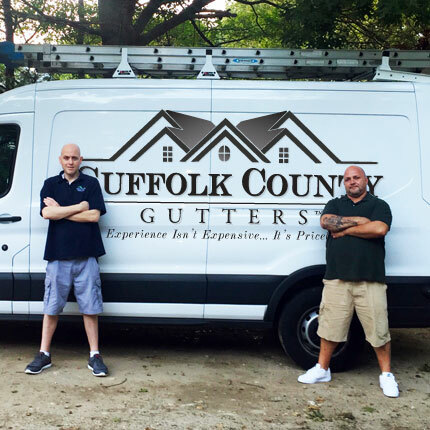 Suffolk County Gutters serves the greater Suffolk & Nassau County Long Island areas. We are a family owned and operated company with over 20 years of experience in the industry. We are attentive to our customer's needs, detail oriented, and are passionate about the work we do. Whether you are in need of a complete new seamless gutter system, gutter guards, or simply a gutter cleaning. We are committed to delivering you the best craftsmanship possible; along with excellent customer service. Our service, dependability, and products are the highest quality available in Suffolk County Long Island. Suffolk County Gutters offers leaf protection & gutter guard solutions to compliment your budget & preference. From economical gutter screens to durable guards, the products we offer are tested and proven. Suffolk County Gutters are here to help keep debris out of your gutters and keep your structure looking its best. Suffolk County Gutters Inc is fully licensed and insured for both Suffolk and Nassau County! Our work is also always under full warranty!